The Little Ripper March : for concert band [eScore] / David Stanhope. Instrumentation: Piccolo, 2 flutes, 2 oboes, clarinet in Eb, 3 clarinets in Bb, bass clarinet, contra alto clarinet in Eb, 2 bassoons, 2 alto saxophones in Eb, tenor saxophone in Bb, baritone saxophone in Eb, 4 trumpets in Bb, 4 horns in F, 3 trombones, euphonium, tuba, percussion. The Little Ripper March is my most popular composition, especially in the concert band version. The original version was for brass band, but there are other versions for orchestra, bassoon ensemble, trombone ensemble or solo piano. First performance by Australian National Wind Orchestra, David Stanhope — 1989. This is my most popular work for concert band, having been played in several countries. The 6/8 style is easily recognizable as being in the tradition of tuneful marches. Score: The Little Ripper March : for concert band / David Stanhope. Parts: The Little Ripper March : for concert band / David Stanhope. Parts [ePDF]: The Little Ripper March : for concert band [eParts] / David Stanhope. CD: Music for winds II / the Australian Wind Orchestra. 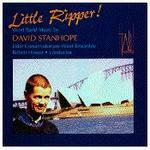 CD: Little ripper : wind band music / by David Stanhope.